Infranetworking Review 2019: Is Infranetworking a Good Hosting? Infranetworking offers a comprehensive set of affordable hosting services and associated support for Spanish-speaking customers. Established in 2002, Infranetworking was a cabling and network company before it became a web hosting and Linux server management provider. With 14 years of experience in the hosting industry, Infranetworking continues to serve its customers (almost) exclusively in Spanish. Infranetworking offers web hosting, cloud hosting, dedicated servers, semi-dedicated servers, multiple domain hosting, and WordPress hosting services that cater to individuals and businesses. This vendor’s user-friendly cPanel-powered web hosting allows anyone to set up and manage a website in minutes with little technical knowledge. The web hosting solutions are backed by a competent technical support team and a comprehensive set of tutorials. The latest CentOS-based software and Intel hardware configurations are used for faster web page loading speeds. 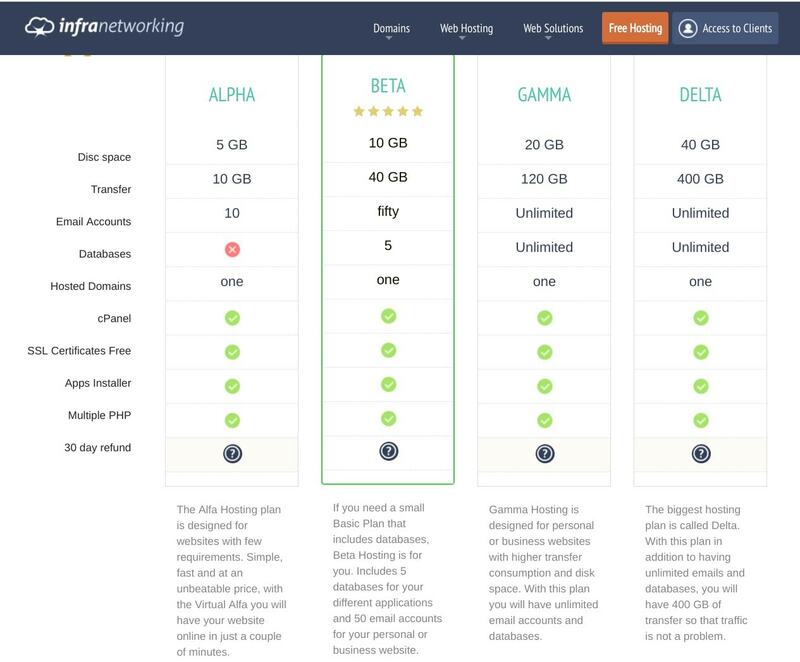 The four web hosting plans are ALPHA (5 GB disk space, 10 GB transfer, no database), BETA (10 GB disk space, 40 GB transfer, 5 databases), GAMMA (20 GB disk space, 120 GB transfer, unlimited databases), and DELTA (40 GB disk space, 400 GB transfer, unlimited databases). All plans allow only one domain. Infranetworking’s 99% uptime guarantee is a little low by industry standards. Hosting packages can be purchased at affordable VAT-inclusive prices on billing cycles from one month to 36 months, with the equivalent monthly price reducing according to the length of your commitment. If you’re cautious about committing for a full 36 months, you can take comfort from the 30-day money-back guarantee that should get you out if it all goes wrong within the first month. Or, why not take them for a test drive on a 30-day free trial before making any kind of commitment? You also get a free SSL certificate with the hosting plans and two months of free hosting with any annual plan. Infranetworking provides 24/7 technical support primarily in Spanish for those of you who are “Tired of having to request support from companies in English.” That said, I decided to test their English-language support via live chat and was not left disappointed. Support channels include telephone, ticket, Twitter, and Facebook, but before summoning support, you may well be able to answer your own questions by referring to the very comprehensive self-support resources including FAQs and tutorials. 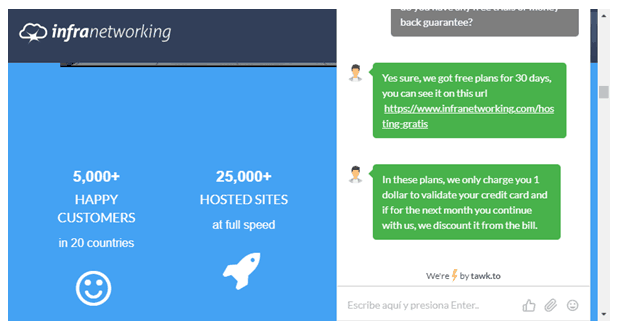 If you’re looking for a comprehensive set of hosting services with associated support in Spanish, you could soon find yourself working with Infranetworking. Wondering how Infranetworking stacks up against other Web Hosting companies? Enter any other Web Hosting company and we will give you a side-by-side comparison.